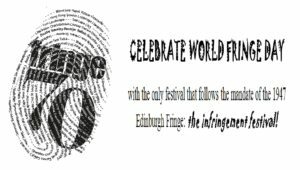 On July 11, Fringe Festivals around the world are celebrating “World Fringe Day”, the 70th anniversary of the founding of the Fringe in Edinburgh in 1947. The festival was born when artists were told they couldn’t perform at the Edinburgh International Festival, so they protested by doing their shows on the “fringe” of the event. Their brave and defiant gesture sparked a whole new way of doing the arts: rebellious, independent, artist-run, inclusive, and Do-It-Yourself. Their original mandate was simple: anyone can play on the fringe – with no administrative cost. 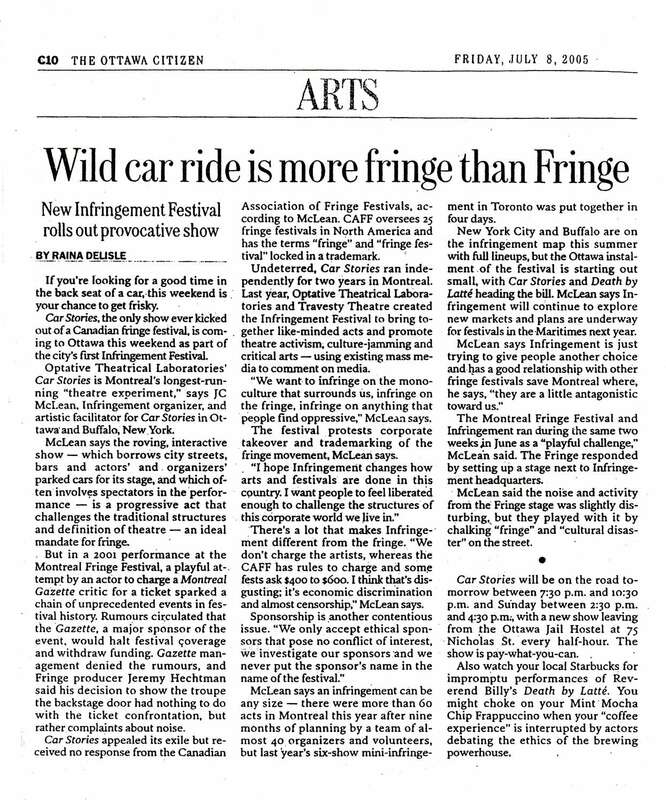 Ironically, the same artists who established the Fringe Festival 70 years ago would not be allowed to play at most of the 200+ Fringe Festivals that exist today under the same conditions. Many Fringe Festivals have policies that force artists to pay often-hefty fees to administrators in order to participate. Critics have questioned these policies because they exclude artists who cannot afford to perform. Due to these policies, the Fringe, once an inclusive festival run by rebellious artists, is now overseen by administrators and often doesn’t resemble the original creation. 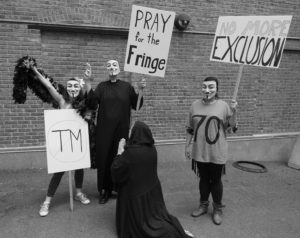 For example, an organization called the Canadian Association of Fringe Festivals trademarked the word “Fringe” in 1998 and now threatens legal action against artists and students who attempt to do Fringe arts without their permission. Furthermore, there are a host of other questionable practices at Fringe Festivals that do not match the original intentions of the artists who founded the Fringe in 1947. In response, artists at the Montreal Infringement Festival, one of the rare festivals that still follows the original Fringe mandate of 1947, propose asking UNESCO to protect the Fringe, including artists, spectators and communities that participate in the festivals (and those who are excluded from them). 3. The inclusion of artists in key decision-making processes at all Fringe Festivals. Artists founded the Montreal Infringement Festival in 2004 in reaction to excessive corporate interference at the St. Ambroise Montreal Fringe Festival. In 2001, an experimental play called Car Stories was kicked out after a corporate sponsor was offended. When the festival refused to refund artists the hefty fees required to participate or pay them their ticket sales, the artists vowed to fight back against what appeared to be the co-opting of the Canadian Fringe Festival movement by corporate interests. For 14 years, artists have staged the Infringement Festival as an alternative to the trademarked Canadian Fringe Festivals. As keepers of the original Fringe mandate of 1947, they ensured that artists never had to pay to play and that nobody was ever excluded or censored. In 2012, Infringement artists were invited to the inaugural World Fringe Congress in Edinburgh, Scotland. At the Congress, Infringement founder Donovan King wrote a critical analysis about problems facing the Fringe internationally. In 2014, he was invited again and followed up with a workshop entitled “A World Fringe Philosophy” where he outlined some of the more problematic issues facing Fringe Managers. He also performed a show at the Edinburgh Fringe called Critical Report from the World Fringe Congress, which has also played in other cities in the U.K., Ireland, the U.S.A. and Canada. In 2016, a decision was made to hold the World Fringe Congress in another city and Montreal was selected. Hosted this time by the Canadian Association of Fringe Festivals and the Saint Ambroise Montreal Fringe Festival, the Congress had an application form for the first time ever. When Montreal and Buffalo infringement festivals applied to send delegates, they were rejected, despite the fact they are among the few festivals that still follows the mandate of the 1947 Edinburgh Fringe. Not only were their critical voices absent at the Congress, but their entire festivals were missing from the World Fringe Fair, a showcase of festivals around the world. For the excluded artists, the 3rd World Fringe Congress was Kafkaesque: having a nightmarishly complex, bizarre, or illogical bureaucratic quality in which people are oppressed by nonsensical, blind authority, resulting in anxiety, alienation, exclusion and powerlessness. Infringement founder Donovan King wrote a Letter of Complaint to Edinburgh Festival Fringe Society CEO Shona McCarthy and hosted both an infringement festival and the first-ever World Infringement Congress to challenge the exclusion. He also invited members of the Canadian Association of Fringe Festivals to a debate about the Fringe trademark, which they refused to attend. While ultimately the censored artists were excluded from the 3rd World Fringe Congress in Montreal, the CEO of the Edinburgh Fringe and several other international Fringe Managers did attend the World Infringement Congress. The artistic and cultural dialogue was successful: the excluded artists were invited to the next World Fringe Congress in Edinburgh in 2018 by the CEO. The invitation was heavily applauded by members of the audience. In addition to planning to call on UNESCO to protect Fringe Festivals worldwide, the Montreal Infringement Festival is also celebrating World Fringe Day with a party and open mic at Bar Bifteck, the site where the Infringement Festival was born in 2004. Last but not least, the festival is releasing footage of the 2016 World Infringement Congress for those who missed the event and want to learn about the issues. 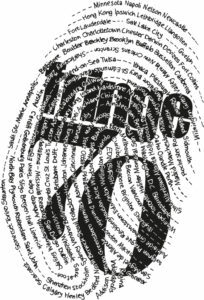 As the keepers of the Fringe mandate of 1947, Infringement artists plan to honor the brave souls who challenged exclusion and played on the fringe 70 years ago, sparking a whole new way of doing the arts. They also plan to question why there is so much exclusion at Fringe Festivals today when it was originally designed to be inclusive. 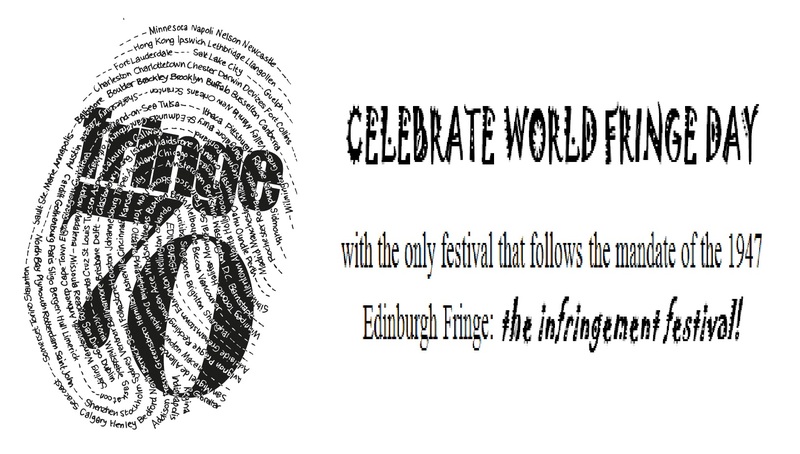 The irony that the World Fringe Congress excluded the only artists who follow the original mandate of the 1947 Edinburgh Fringe is a clear demonstration that UNESCO needs to intervene to protect human culture from corporate manipulation. As such, the Infringement artists are hopeful that UNESCO will look favorably on their upcoming application to protect the Fringe for future generations. 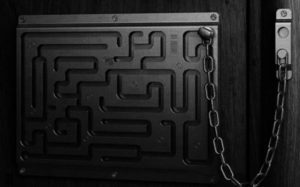 This entry was posted on Monday, July 10th, 2017 at 10:11 am	and is filed under Uncategorized. You can follow any responses to this entry through the RSS 2.0 feed. You can leave a response, or trackback from your own site.